In the arena of imperial research — as in any research arena — the most wonderful discoveries often arrive unbidden when one is looking for something else entirely. While on such a quest recently, I stumbled across the following item in the Petaluma Weekly Argus of 16 April 1880. Emperor Norton had just died in January. EMPEROR NORTON. — We have received the March number of The Illini, published at the Illinois State University. In it is a very truthful sketch of the life of Emperor Norton from the pen of R.D. Faulkner, the Bodega correspondent of the ARGUS. The sketch is illustrated by a rough woodcut of the Emperor, which is readily recognized by those who knew that eccentric individual. Cover page of The Illini, volume 9, number 6, March 1880. Source: Illinois Digital Newspaper Collections. Properly speaking, the publication in question, The Illini, was the student magazine of Illinois Industrial University — the precursor to the modern-day University of Illinois at Urbana-Champaign. “R.D. Faulkner” — “R.D.F.” in the table of contents opposite — was Richard D. Faulkner, a former student business manager of the magazine, who had graduated from the university with a Bachelor of Literature in 1877. Evidently, Faulkner was a Northern Californian who, after graduation, moved back to his native Bodega — in Sonoma County — but maintained connections to the university and the magazine. We met the Emperor the first day we were in San Francisco. We had sauntered out from our lodgings on Kearney Street with no aim in particular but to view “the wonder of the continent.” We had not traveled far before we encountered one of those bookstores to be found on the street corners of every large city. At the solicitation of the petite librarian we stopped to view his shelves. We had just interested ourselves in an antique volume describing the amours and intrigues of a South Sea princess, when our attention was attracted by the approach of a figure clothed in a ci-devant uniform, set off with brass buttons about as lusterless as those usually seen on a seniors uniform, heavy epaulets tarnished as much as one would expect to see upon a British general returning from a campaign in Afghanistan or Zululand, a silk sash, a beaver hat and feather cockade, a tri-colored umbrella, and a cane representing a snake wound around a limb. This was the Emperor. The form was bent by age and the imaginary cares of state. The face was one “that you might look upon but once, and yet wear it in your memory forever.” His nose was aquiline, the tip of which was garnished with a redundant growth of capillary appendage. His majesty saluted me with dignity and addressed me courteously. Afterwards we frequently met him in our rambles around the city. He was an interesting conversationalist, often facetious but never tiresome. The future visitor will miss his well known form from its wonted haunts. It’s not difficult to imagine that Richard Faulkner — moved as he was to pen a four-page tribute in the immediate wake of Emperor Norton’s death — might have spent a fair amount of time in the mid 1870s regaling his Midwestern classmates with stories of the Emperor. Geoffrey Thomas Ross — of the University of Illinois’s History, Philosophy and Newspaper Library — suggests that Richard Faulkner himself might have created the artwork for the piece, with a different artist (or artists) translating Faulkner’s work into a carving and then a print. Those familiar with the illustration of the Emperor that ran in the San Francisco Chronicle in November 1879 will detect what is the apparent inspiration for the artwork. Whichever is the original artist or the inspiration, though, the print — a legacy outpost in far-flung Illinois — is a wonderful tribute. “Emperor Norton I,” woodcut illustration for article, “Emperor Norton I” (Sketches of California series), in The Illini, volume 9, number 6, March 1880, p. 174. Source: Illinois Digital Newspaper Collections. 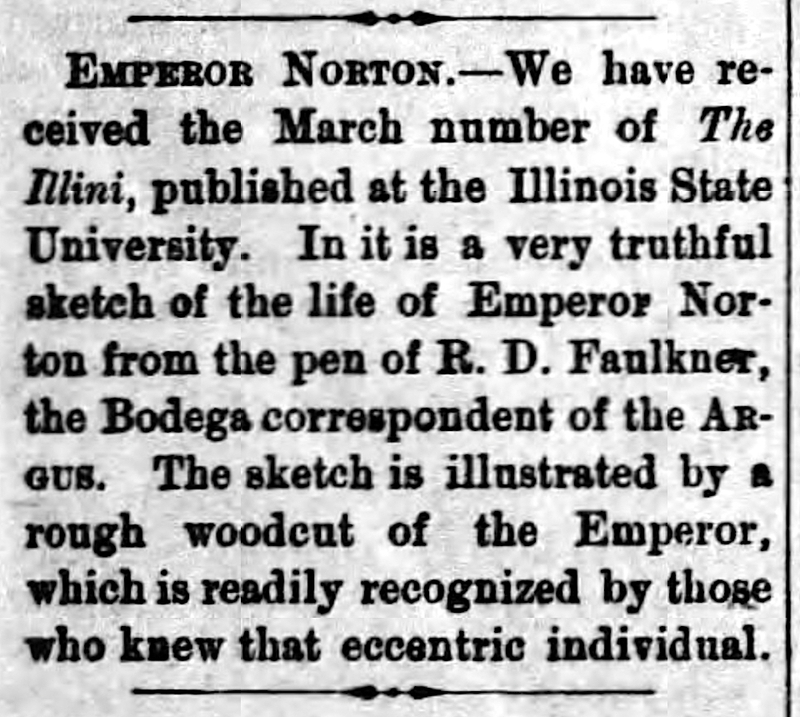 * Many thanks to Geoffrey Thomas Ross and Will Schlaack, both of the University of Illinois, for research assistance and for providing a high-resolution image file of the page of the March 1880 issue of The Illini that features the woodcut illustration of Emperor Norton. The illustration of Emperor Norton featured here is included in the “flat works” gallery of The Emperor’s Bridge Campaign’s digital ARchive of Emperor Norton in Art, Music & Film (ARENA).